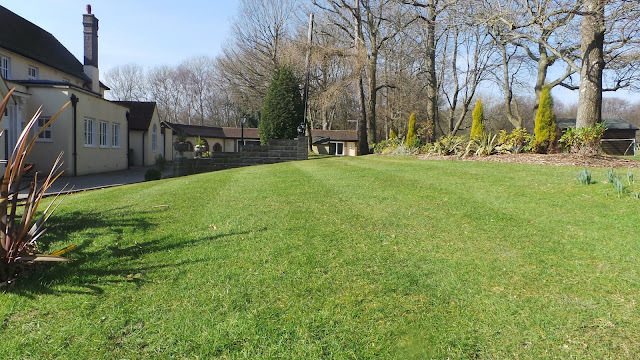 Leading on from our previous blog- Spring Clean Your Garden - 5 Top Tips we would like to look deeper into grass cutting and in particular how to mow your lawn correctly. Often when passers by see our lawn mowing they remark- "What a nice looking lawn" or "Wow, lovely stripes" It's almost like they think we have a magic formula for making the grass grow stripy! However, by following a few simple steps you too can have a smooth, lush green, stripy lawn. 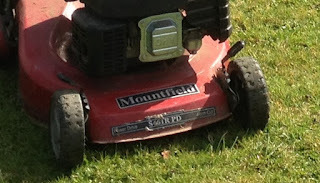 Now we are not expecting you to have a range of mowers in different widths and styles as a professional gardener would. You'd be surprised how many gardens we go to for quotes to cut long grass and the customer says "My Flymo wouldn't get through it!" The type of mower you choose will depend on the size of your lawn, turf type and style of lawn. Which? has a good guide to choosing the best lawnmower for your garden. The key advice here is never to remove more than 1 third of the blade at a time. There is always a temptation to take the grass height right down as short grass looks attractive. But this could do more harm than good. The first cut of Spring should be on the highest setting. In periods of drought, heat, cold or constant rain the grass will need all the help it can so set the cutting higher. As the growth picks up in Spring and after the heat of summer in Autumn lower the cutting setting by 3/4". Whatever you do, don't cut the grass right down if you have left it get overgrown. Instead, cut a third of the blade and repeat in 3 days time and again if necessary. Getting out in the sun makes you happy! Too often people let the grass grow and then hack it down too low in the hope they don't have to get the mower out again for a while! Throughout the Spring and Autumn the grass would benefit from a weekly cut if possible and fortnightly during Summer. It is a misconception that grass does not grow through winter- it all depends on the temperature and how bad the winter gets. You should avoid cutting when the grass is frozen or boggy and saturated with rain water and obviously if it hasn't grown then it doesn't need a cut. It is rare that you will have to cut it in winter but if it has been a mild winter and the grass has grown, remember to mow on a high cut setting. No just kidding, it is all down to a roller and the correct mowing pattern. The roller is doing the job of flattening the grass blades and by mowing in different direction the light will catch the blades of grass and it appears stripy. So, starting with a mower with a rear roller, mow around the edge of the lawn. Now position yourself within this rectangle on the left side and mow up and down in straight lines. Be careful that you don't 'scalp' the lawn on the turns, you must slow down and stop so that can position the mower so that the next line will just overlap the previous line. If you have a lawn that is an irregular shape then all you need is the first line straight and then work on from that one. To ensure the lawn grows healthy, change the direction you stripe every now and then, e.g. diagonally. Soon your neighbours will be admiring your new stripy lawn! 1. Checking bolts on wheels and looking for wear and tear on tyres. 2. Brush out and wash out grass collector and leave hanging to dry. 3. Inspection of cutting blades. Sharp blades will give a better cut. If you don't feel confident sharpening them yourself, your local garden machinery centre will provide this service for a small fee. We recommend Cuckfield Garden Machinery in Haywards Heath and Farm Supplies in Dorking if you are local to Surrey and Sussex. This is only a very small list of maintenance checks- for more comprehensive checks search the internet for your make and model of mower or contact a garden machinery centre that can assist you. 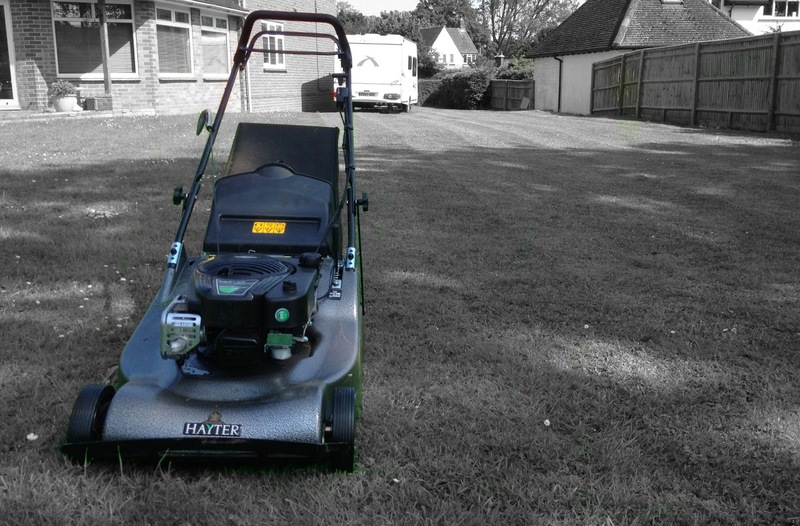 On a final note, if you need assistance with regular lawn maintenance and mowing in Crawley, Horsham and Dorking then please contact us on our website - Ayegardening.